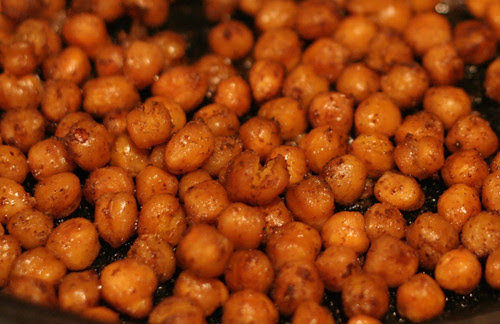 Honey & Butter: Garlic Roasted Chickpea "Nuts"
This healthy snack will definitely keep you satisfied! When roasted, the chickpeas become crunchy just like peanuts...kids will even love them! Preheat oven to 400 degrees. Place chickpeas in a bowl and drizzle olive oil to coat. Sprinkle on about 1 tablespoon of the garlic salt (or to taste) and toss. Pour out onto a baking sheet in a single layer and roast for about 30 minutes or until golden and crispy. Remove from oven and sprinkle with parm cheese if desired.